A car in the typical Indian middle and upper middle-class is a special asset. A car purchase is often well-thought of and researched before the final decision is taken as it is not just an individual affair, but a sensitive family matter. Besides, a major chunk of family savings also goes into it. Thus, each and every step – pre as well as post – are very, very important for the customer. The entire journey experience will determine the customer loyalty with the brand. Several car brands and showrooms embark on aggressive advertising to give potential customers a smooth phase, both before and after the purchase. These can range from hoardings to actual test drives. 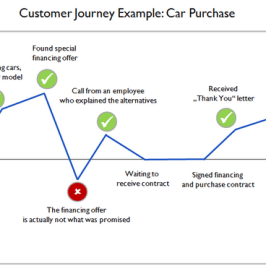 In fact the pre purchase phases of assisting customers make the right choice is also considered to be a part of the customer journey experience. However, there are a lot of communication gaps these days between consumers as well as the car showrooms and sometimes the brand themselves post purchase. Yes, managing a car is a huge burden when it runs into a mechanical glitch, an engine breakdown, a flat tire or a road side accident; making a healing touch faced with such a situation as well as positive reciprocation is essential. This is a delicate phase and needs special attention. To help your customers the proper channel to reach you, use emerging cloud-based customer relations software (Eg: Glad Minds CONNECT). Such software facilitates better communication for the customer with the Brand and the alert. Install now and see the difference!